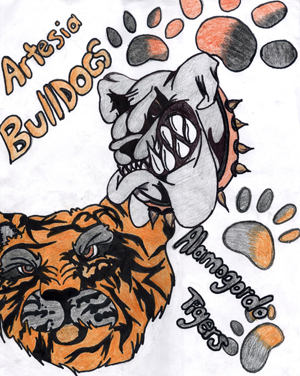 An Artesia Bulldog and Alamogordo Tiger prepare for battle in this drawing by Artesia High School sophomore Barbara (Aline) Macias. The ‘Dogs will take on the undefeated Tigers at 7 p.m. today at Bulldog Bowl in their first home outing since Sept. 11. Overall, the Bulldog football team’s long road stretch yielded positive results. A 37-0 win over Deming Sept. 18 was followed by a 31-13 victory over county rival Carlsbad Sept. 25 to bring the team’s record to 5-0. But a trek west to Las Cruces High Oct. 2 saw Artesia suffer its first loss, 41-25, without the services of its starting quarterback. Having been a month away from the friendly confines of Bulldog Bowl, the ‘Dogs will no doubt be eager to perform in front of a home crowd in their last regular-season clash and final game before their open date. But however road weary, they’ll have no chance to rest on their laurels as they line up against Class 6A unbeaten Alamogordo. “We’re really excited about the opportunity to play the quality of team we’re going to play this week,” head coach Cooper Henderson said Thursday. “The Tigers are undefeated and have pretty well dominated all their opponents throughout the season. The Tigers have effectively plowed through their 2015 slate thus far. Only Mayfield Sept. 18 was able to come within 20 points of Alamo, 46-28, and overall, the boys in black and gold have outscored their opposition 324-66. Most recently, the Tigers dispatched Deming 56-12 at home. Alamogordo is a veteran squad – returning seven athletes on offense and five on defense from 2014 – with strength across the board. Their offensive line, which averages 6’1”, 240 pounds, has been effective all season at protecting junior second-year QB Kyle Hooper and opening holes for senior running back Hunter Graham. Graham was 27-181 rushing with two touchdowns and 4-38 receiving with a TD against Artesia in 2014, while Hooper completed 21 of his 25 passes for 146 yards and three touchdowns. The ‘Dogs took that outing on the road, 48-41, in the teams’ first meeting since 1989. The Bulldogs, meanwhile, will again be missing senior quarterback Justin Houghtaling today but will be looking for an improved showing from the offense under the direction of sophomore Taylor Null. Null and his backs understandably had difficulty finding fluidity last week in Las Cruces but showed progression as the game went along. The Orange Crush defense will also be seeking to improve over Oct. 2, which saw the unit at times manhandle the Bulldawgs while giving up big plays to workhorse QB Kameron Miller and Co. at others. Although rain is forecast, it shouldn’t dampen the spirits of the Bulldog faithful as the ‘Dogs prepare to cap off a solid regular season. “We’re really looking forward to great things out of this football team, and I think this will be a great challenge for us going into district play,” Henderson said.